I promised I would share my Melbourne SOS ~ Sounds of Source adventures, so here I am! The journey was magical in so many ways, as it was with the inaugural South Queensland leg of the tour. Many beautiful signs of confirmation were gifted to me, demonstrating a Divine Hand at work on this project. Some significant themes and patterns have begun to emerge, as I travel around the country to do these Sounds of Source Transmissions. I arrived in Melbourne to a wild, wet and windy city – a far cry from the sunny blue skies I’d left in Cairns that morning! A minor blip occurred when on picking up my hire car, I was told they could not possibly release it to me. My wallet had been stolen a few days before, so my credit cards had been cancelled – an essential piece of travel equipment as I now found out! Werribee ‘Sounds of Source’ assistant Christine Scott came to my rescue however, racing down to her local Hertz dealer to act as guarantor. Thank you Christine! 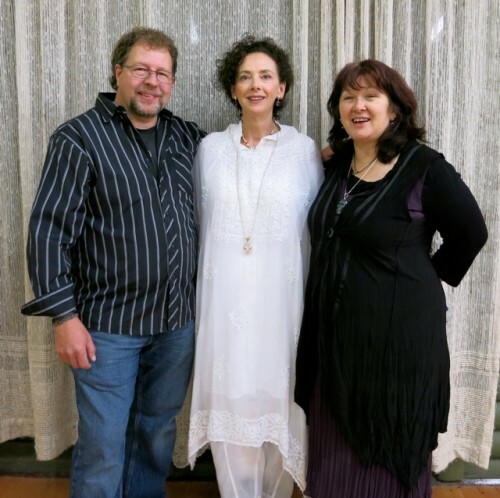 While travelling between the South Queensland events a couple of weeks before, I had found myself singing with great purpose to the land -‘trailing’ the ‘Sounds of Source’ energy between each of the venues. No sooner had I left Melbourne airport than this started to happen again, initiating a pattern that maintained for the rest of the tour. 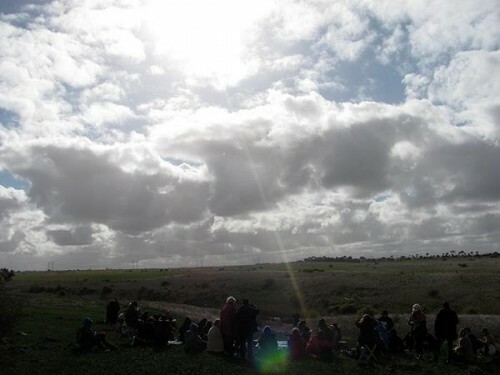 As I got closer to Werribee, the sky cleared and the sun burst through, suffusing the landscape with light – a wonderful omen I thought, for what lay ahead. 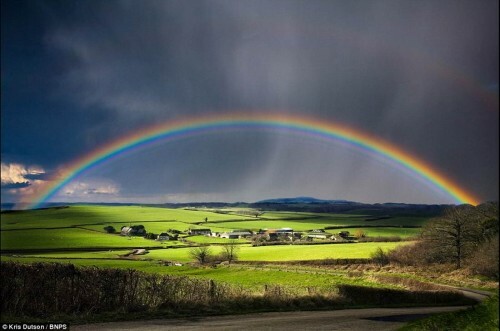 And as I drove through the gateway of my accommodation a scintillating, full spectrum rainbow created a perfect arch of radiance in front of me. I laughed aloud said ‘Thank you’! Within the hour, Werribee SOS Host Maggie Christo and Christine had picked me up, for our drive to the city and dinner with most of the other SOS Melbourne Hosts. This was a get-together we’d all been looking forward to eagarly – an opportunity to meet, relax and unite before our ‘work’ truly began. Dinner got off to a rather unique start! 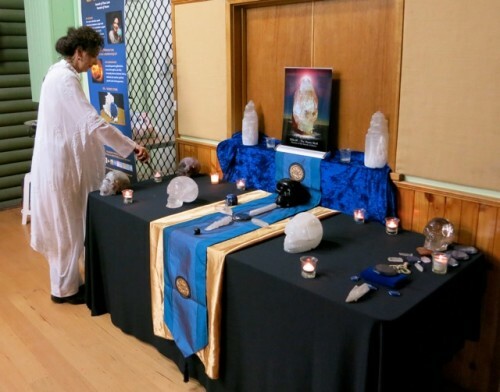 During the previous week, Montrose Host Shirley Coventry’s new Selenite crystal skull had communicated to me that it wished to be present at her event in Montrose. 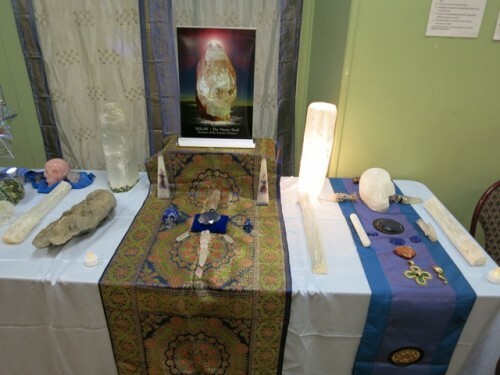 Shirley had certainly taken me at my word for there sitting on the table when I walked into the restaurant, was the Selenite skull in all its glory!! Asked if I’d like to the skull to accompany me throughout all the Melbourne events, my immediate answer of course, was a big ‘Yes’! Having inherited this skull from a previous caretaker in Holland, Shirley clearly wasn’t entirely comfortable with its name. So when my eyes fell upon the skull next morning on waking, I asked it ‘What is your name then?” Instantly and clearly I heard ‘Lumiere’. 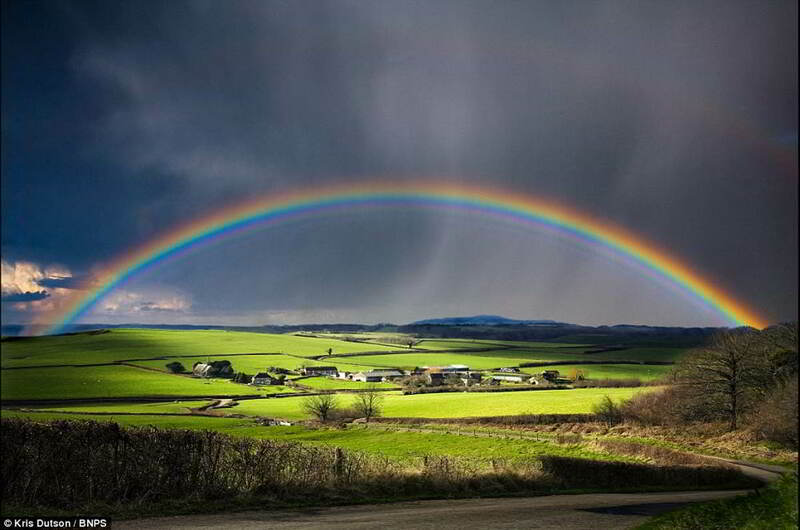 “How perfect”, I thought…Lumiere – the French word for ‘Light’. And what an appropriate companion and assistant I’d been sent for the task at hand! Discovering that Maggie Christo’s ‘Hands of Light Healing Centre’, is located on a working farm, was not a huge surprise to me. Interestingly, all the Sounds of Source events to date have taken place either in a natural setting, or right on the edge of the ocean. The red tilled earth of Maggie’s farm looked rich and beautiful, and it felt wonderful to have this tangible support and embrace of Mother Earth’s beauty and power on our doorstep for the upcoming event. 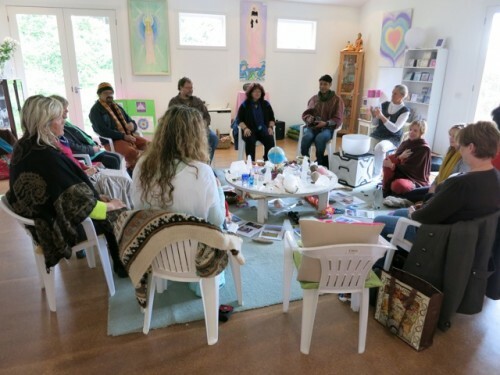 Stepping into Maggie’s new healing centre took my breath away – I could literally feel the Love. 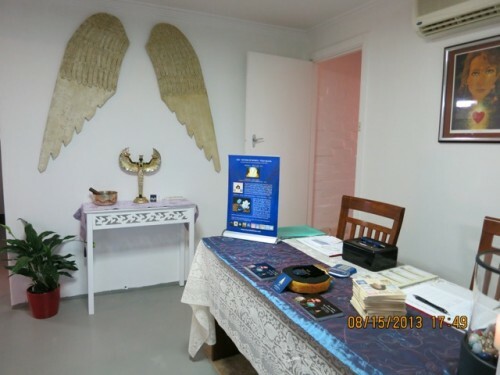 Two huge Angel wings spanned the wall in the entrance hall, beneath which stood a golden winged Isis. Everything in this centre seemed to radiate Light. 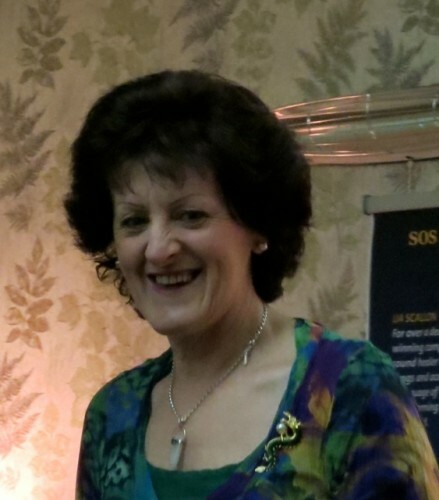 Maggie had worked tirelessly to have everything ready in time for what would be the Centre’s first major event…and it showed. As I walked through room after beautifully decorated room, it became overwhelmingly evident how much love, care, attention to detail had been lavished on this space, to create a haven of sacredness and healing for all who entered. Maggie and her team had already made huge inroads on preparing on the main event room upstairs too. Adorned as it was with beautiful artwork, sculptures, crystal lamps, flowers, and candles, it was perfect for the job at hand. Above all, the energy throughout the whole centre, was pristine. 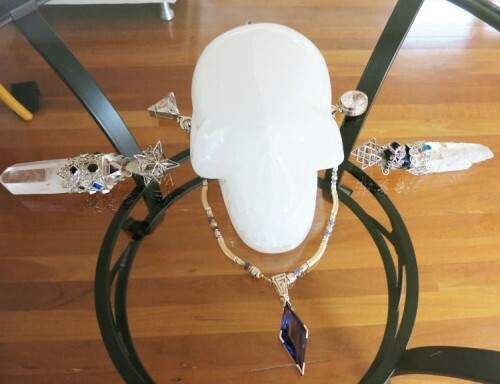 By the time we had completed dressing ‘The Master Skull Solar’s’ altar, it looked magnificent! 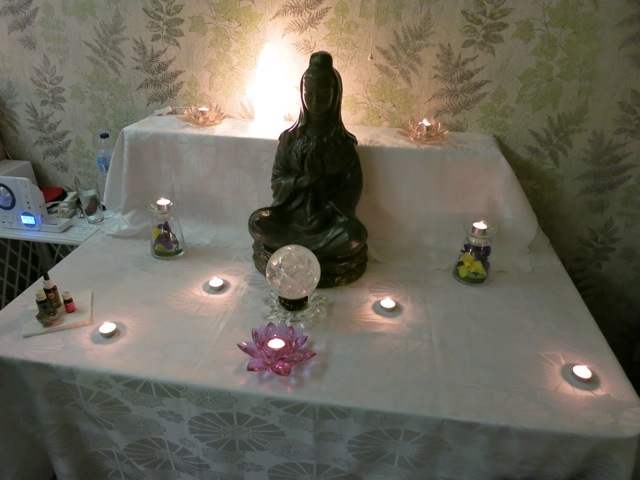 A second altar honouring the Divine Feminine and featuring a statue of the Lady Kuan Yin, glowed with purity and beauty. There were no seats to spare that evening! 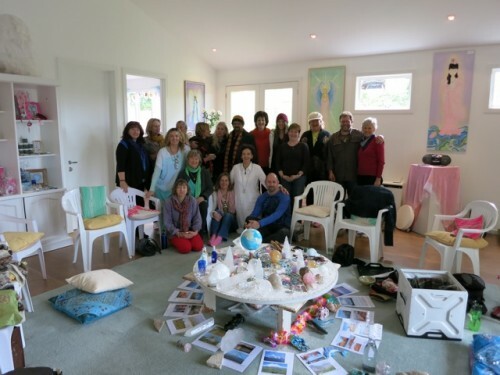 The full house of attendees were cocooned in warmth and nurturing on every level, including a delicious supper provided by Maggie, with platter upon platter of delectable home-cooked goodies! The first Sounds of Source event in Werribee turned out to be a magnificent night, in every way possible. 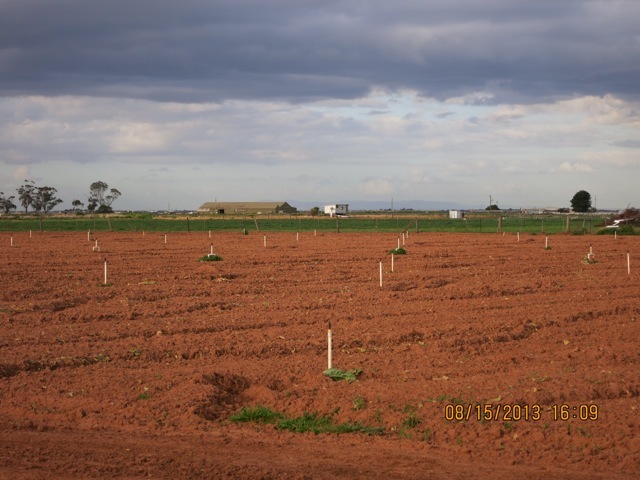 Next morning, I set out for Montrose – Shirley Coventry and co-host’s Anthony Kilner’s neck of the woods. 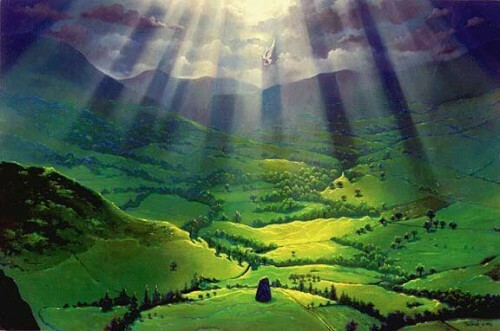 The ‘Sounds of Source’ energy was ‘trailed’ all the way there, as I sang to the land. 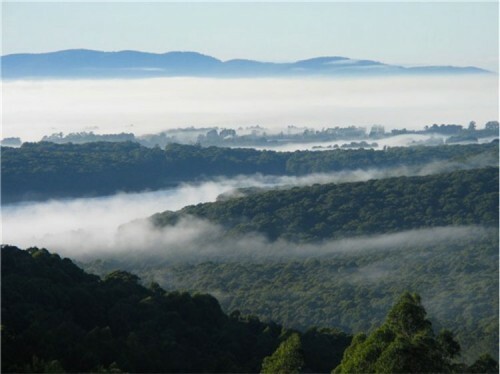 I soon became aware of another pattern or link with Queensland emerging – the important role of the mountains. In South Queensland, the mountains seemed to be an integral part of what I had been called there to unfold. I quickly came to understand that specific mountains were acting as a sort of antennae, helping to pull the Source energy for the Transmissions in, and amplifying it. On nearing Shirley’s home, I realised that I was in the vicinity of Mt Dandenong. Shirley later confirmed that the Montrose venue was indeed located on Mt Dandenong, the original home of the Wurindjuri tribe, which is overseen by eagle spirit. 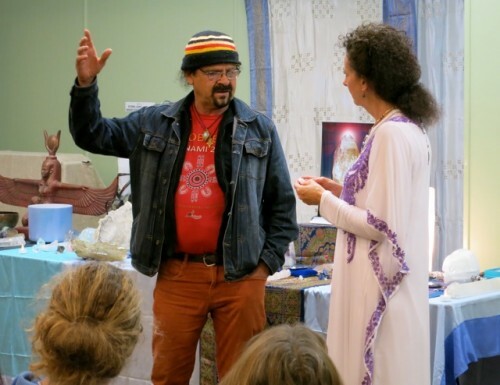 Shirley believes there’s a ‘portal’ or energy vortex in the area. The nearby church of St. Michael and All Angels in Kalorama she says, is connected to Findhorn and to Chalice Well in Glastonbury, and she and her friends have had many spiritual gatherings in these places. 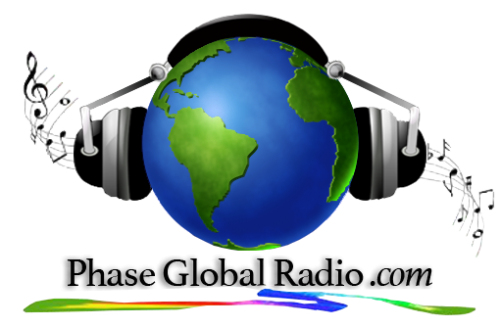 This piece of information confirmed for me yet again, that there is a Divine Plan in the specific geographic locations chosen for the ‘Sounds of Source’ events. I’d just come from Werribee which is located right beside the You Yangs, and the final two events were to take place on the Mornington Peninsula. 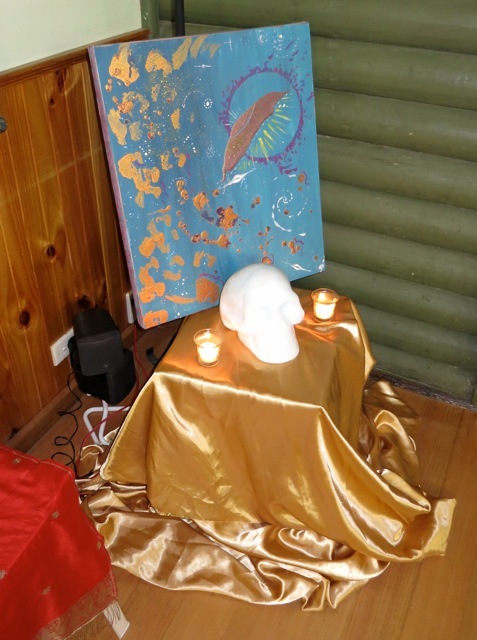 Further reinforcement of the significance of these locations later came from an Moonee Ponds SOS attendee Kylie, who spoke of a ‘portal’ or ‘Landscape Temple’ created by four Melbourne mountain ranges – Mt Dandenong, the You Yangs, Arthur’s Seat on the Mornington Peninsula, and Mt Macedon. Could it be just a coincidence that three of the four Melbourne Sounds of Source events were to take place in the vicinity of three of these mountains??!! Or that I’d also already visited the forth of these ranges Mt Macedon, albeit a long time ago during my first Christmas in Australia. We know enough about time now to understand that it is not really ‘linear’, as we humans have previously been led to believe! Kylie forwarded me a photo of an event she’d been involved in last year, which took place right in the centre of this portal. Apparently, the Aborigional elder who was their guide on the day, had described this place as equivalent to the white man’s Stonehenge in England. The Light phenomena that appeared in the photo, gives credence to the premise that this is indeed an energy ‘portal’ area. Shirley and Anthony were incredibly warm and welcoming hosts. They had done the most incredible job of drawing people from near and far, to their Montrose event. The little Spiritualist hall was packed to capacity with over 90 people attending, despite the howling wind and rain, and the fact that the hall was in a remote area in the middle of bushland! We did have a few electrified moments of high drama actually! During my channelling of the Sounds of Source Transmissions, the hall suddenly shook in the gale force winds and the lights flickered on an off several times. For a moment it looked like we might end up in total darkness out there in the middle of the bush! 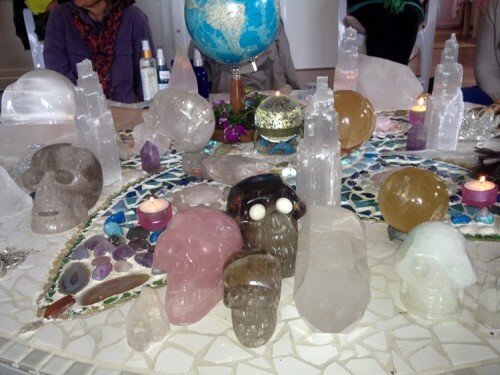 Again, the altars were beautiful….Shirley is the caretaker of many powerful Crystal Skulls besides Lumiere, many of which were present on the night. I’m not quite sure what I was thinking of when I scheduled the Sounds of Source Melbourne events! I had booked them back-to-back, not realising at the time the great distance between some of the venues. In what I now think must have been a some sort of temporary loss of sanity, I had scheduled six events in seven days! This meant that at 11.30pm after the Montrose event, I had to find my way to Moonee Ponds in gale force winds, so that I’d be in situ for the morning set-up for our afternoon start. Beautiful and vivacious Host of Moonee Ponds, Helen Paige had things well under control when I got there however, most ably assisted by her two helpers Nicki and Joanna. Helen is a trance channel herself, and her regular monthly event was to precede mine that day. 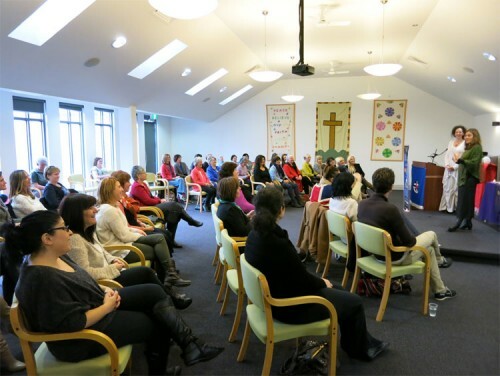 Lucky Moonee Ponds attendees therefore, had the option of a full afternoon Spiritual programme, punctuated by a scrumptious afternoon tea of homemade muffins and cookies provided by Helen! It was a simply wonderful day. 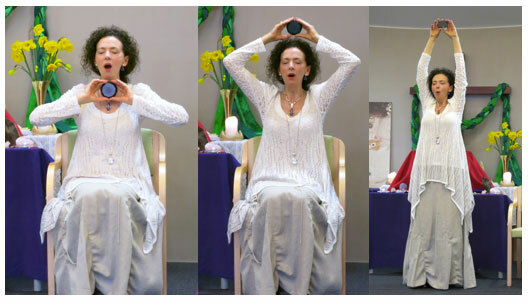 Someone present took some photos, which I think once more demonstrate the power of the SOS ~ Source Stone and how it’s being used to amplify the Sounds of Source Transmissions coming through me during these events. 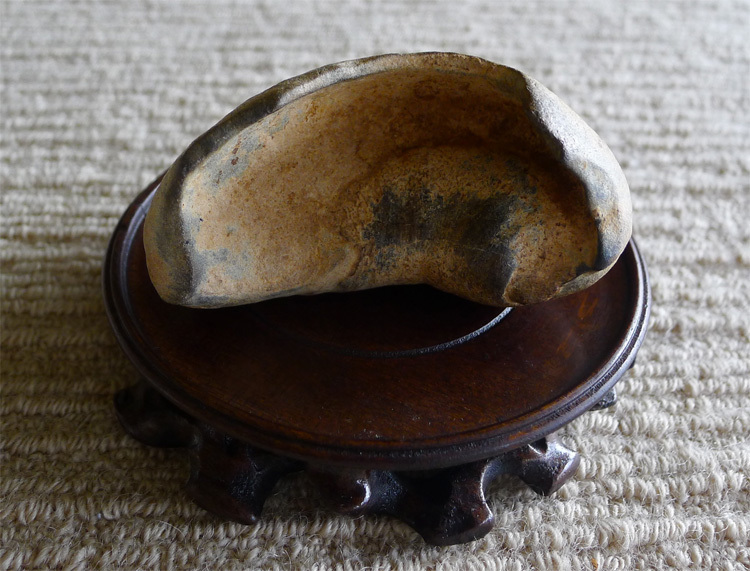 I’ve been receiving some lovely feedback from people who have become caretakers of their own stones too….. Early next morning with the wind still howling, I hooked up my trusty GPS (that ‘virtual’ lady has become my new best friend!) and set off for Seaford and ‘The Mystical Dragon’. Host and Proprietor Amanda Godfrey and her mother Noelene, had made a tremendous effort and could not have been more helpful. 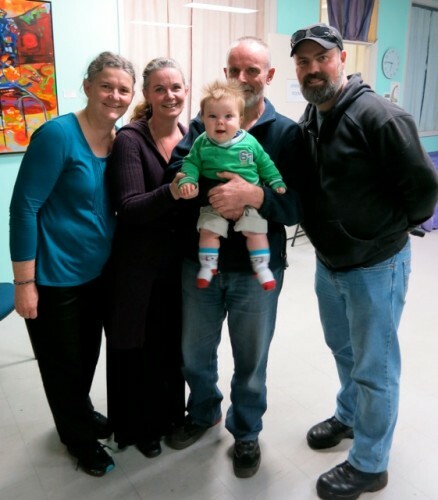 Actually, it turned out to be a real ‘family affair’ with Amanda’s father and husband on hand to lend invaluable assistance as well. There was no contest for the ‘Most Popular Person’ prize on the day however. That was won easily by baby Jaden, whose irresistible, permanently-in-place smile completely stole my heart! 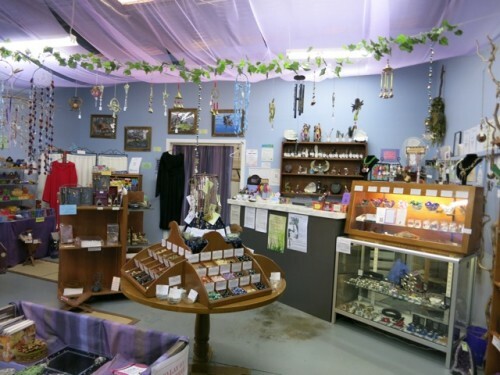 The impressive, Mystical Dragon shop with its wide range of products, was an added bonus for attendees who came early! And thanks to Amanda and Noelene’s excellent networking efforts, it was another SOS full house! From Seaford, I weaved my way onward to the Mornington Peninsula and beautiful Mt Martha. Although the four Cardinal Point Sounds of Source ‘pins’ were now already in place, Spirit had dictated that two further events would be held in Victoria. Mt Martha Hosts Suzi Joy Coombes and Jan Winslade had been so passionate and enthusiastic in their desire to host a Sounds of Source event that it was impossible to say no! 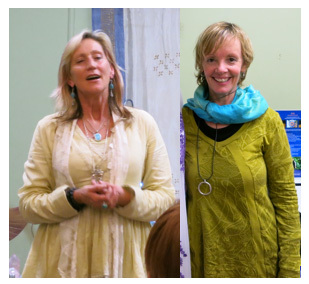 The excitement and commitment of these beautiful women was so inspiring, and my feeling from the outset was that my visit to Mornington would be the ‘icing on the cake’! Various signs I’d received as this journey unfolded, led me to an understanding that there was a specific ‘global’ aspect to the Melbourne SOS Pillar of Light. I sensed too, that the call of the Mornington Peninsula was strongly connected to the Whales. Which is why, in addition to the Sounds of Source event at Mt Martha, I had been prompted to initiate a special ‘Earth Ceremony’ on the Peninsula the following day. 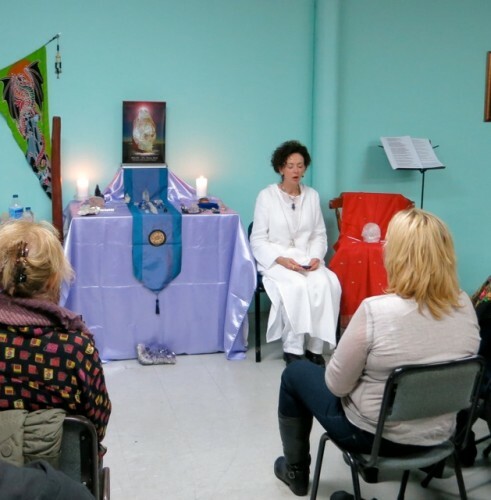 This ceremony would involve a group of invited participants, whom Spirit wished to be present. 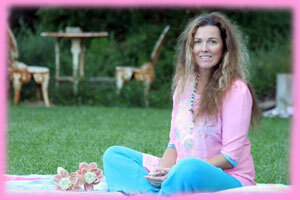 The vision for the ceremony was birthed when Suzi called me about hosting the event in Mt Martha. 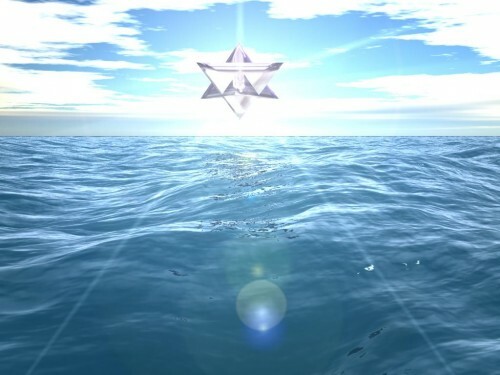 As she spoke to me about the powerful energies of the Peninsula, and about a Crystalline Pyramid that has been seen in the Bay, as well as the regular Whale activity in the area, my channel opened and I received an imperative download of energy. 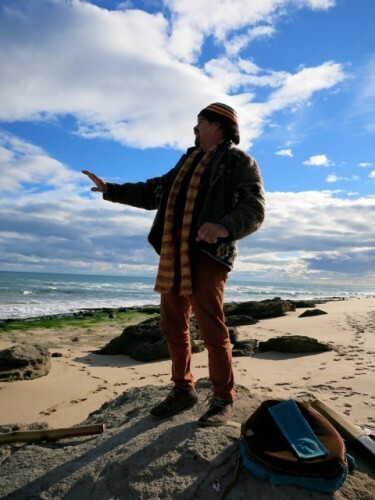 I ‘knew’ in that moment, that the Sounds of Source Transmissions on the Mornington Peninsula were somehow connected to a further activation of that inter-dimensional Pyramid, and to the Whales. My work, which is known as the ‘Sounds of Sirius’, is intrinsically connected to the dolphins and whales. I felt it was no accident therefore, that I was being called to a place the Whales had chosen as their haven. The vision of the Earth Ceremony set in train another chain of events. I was visited with an immediate and strong intuition that I also needed to get in touch with a man called Bunna Lawrie. Bunna is an elder and Song Man of the Mirning people of South Australia whose Dreamtime is the Whale Dreaming. 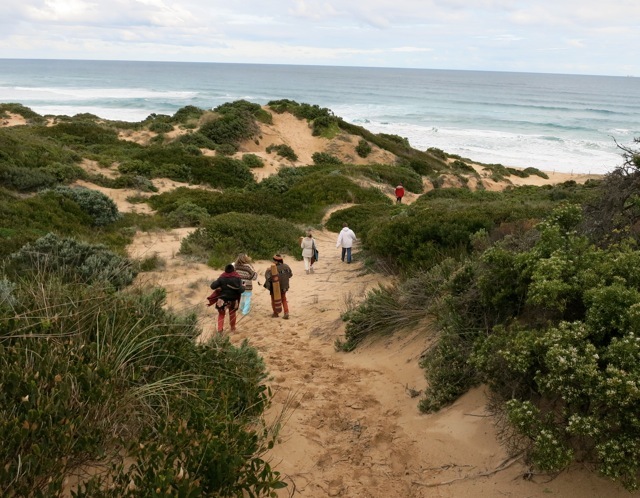 Tragically, the Mirning people have been displaced from their traditional lands around the Bight of South Australia and are currently going through a legal challenge to have those lands returned to them. 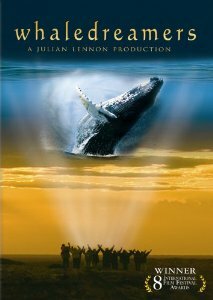 Bunna features in the documentary ‘Whaledreamers’, produced by Julian Lennon and English actor Kim Kindersley. In 1990 when Kim went diving off the coast of Ireland, he had had an epiphany when he looked in the eye of a dolphin. It was an encounter that would change the course of his life. He became convinced that there was a significant connection between whales and dolphins and humanity generally. ‘Whaledreamers’ centres around a global gathering of indigenous elders, for whom the whale has great importance. The gathering was for a whale calling. To make a very long and convoluted story short, that’s pretty well exactly what happened! 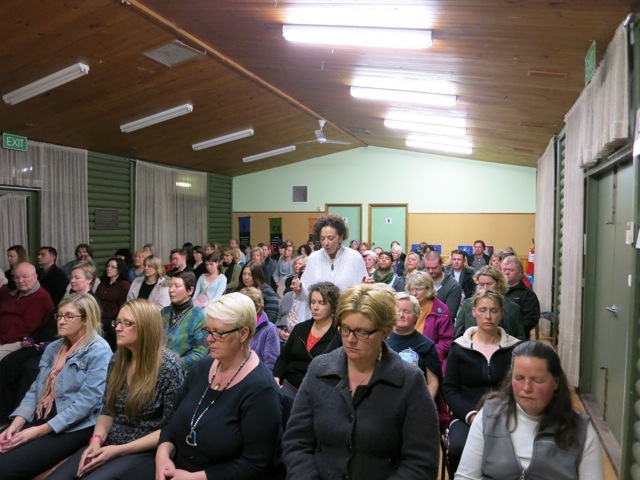 Not only did Bunna take part in the Earth Ceremony, he was also present at the Mt Martha event. And what a fabulous night that was! Having first hired a room to accommodate 50 people, Suzi and Jan had to quickly regroup, as the bookings began to flood in! Yoga guru Jan somehow managed to use her influence to secure the larger hall in the historic Mt Martha House overlooking the Bay. 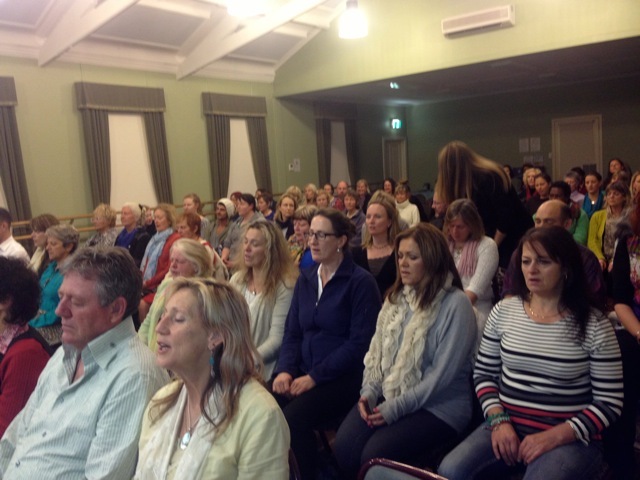 And just as well she did as over 100 people turned up! 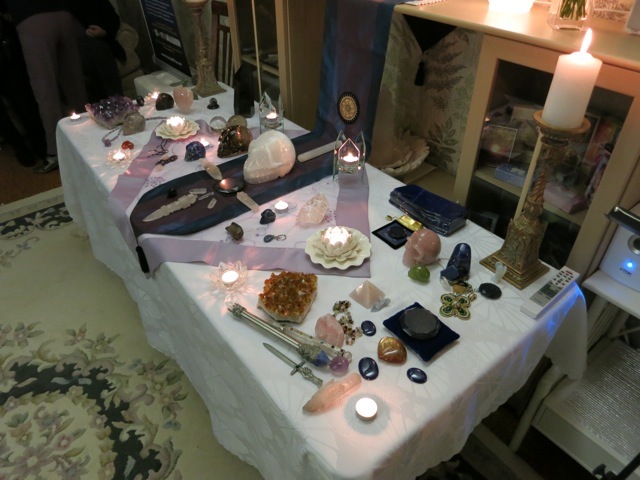 Fellow crystal lover Suzi came laden with boxes of treasures! 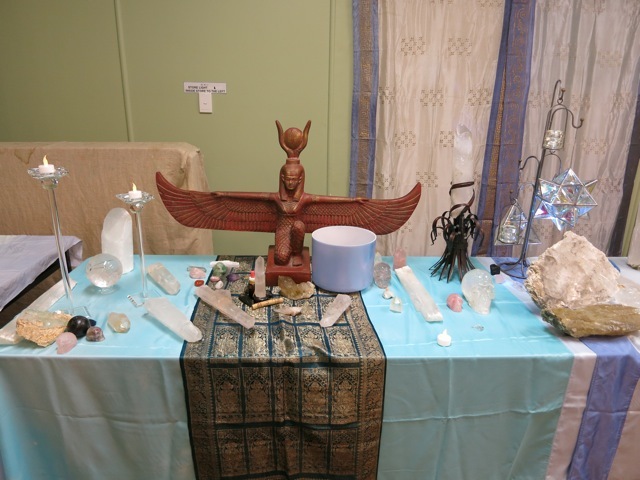 We created a huge altar spanning three trestle tables, featuring some extraordinary crystals and many other beautiful artifacts. At the end of the evening, I invited Bunna up to speak to the gathering, which he did with great ease and grace. Then, as he shared with us the story of Jeedara – the Great White Whale of his people’s Dreaming – he reached into his pocket. handed me something and said, “I brought this for you”. 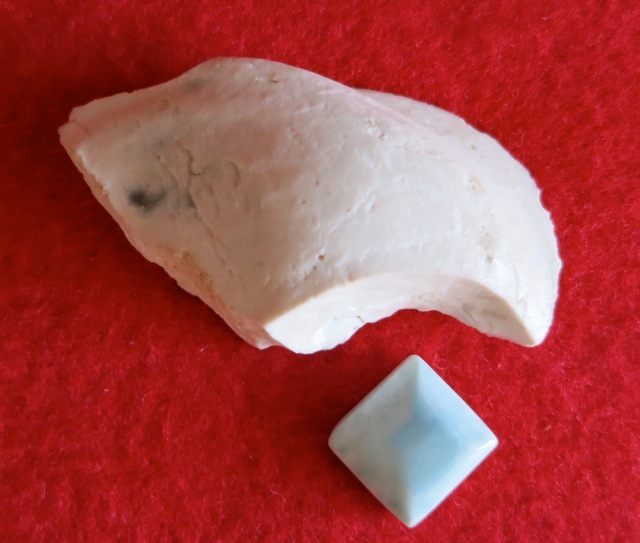 The stone he placed in my hand was of the purest white, and shaped like a whale head, with one black mark like an eye. “This was carved by the Ancestors”, he said. “This is a Whale stone and it’s very powerful”. He explained how his people believe this white stone is the froth from the great White Whale Jeedara’s mouth. I was so humbled by this unexpected gift, and honoured beyond measure to be entrusted with these precious stones. 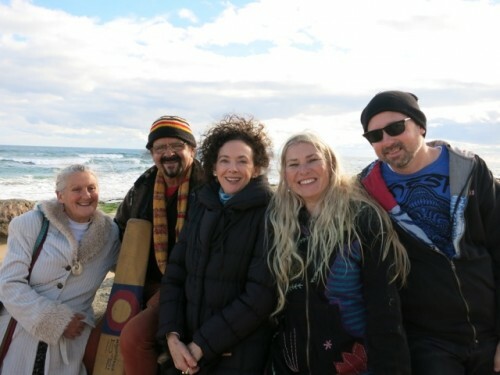 It was a powerful and perfect end to the five ‘formal’ Sounds of Source events in Melbourne, and a very sweet prelude to the Earth Ceremony by the Bay, planned for the following day. As it happened, I had come to Melbourne with a special gift for Bunna too, in the event that we did end up meeting. It sat on the altar behind him that night, but I planned to give it to him the following morning when we met for a one-on-on chat before heading to the Earth Ceremony. My gift to Bunna was the Ear of a Whale, a rare a precious gift given to me by a dear friend in America. When I received the Whale ear, I’d been told it would bring in ‘many new tones’ for me. It is now my heartfelt wish that it will do the same for Whale Songman Bunna too. 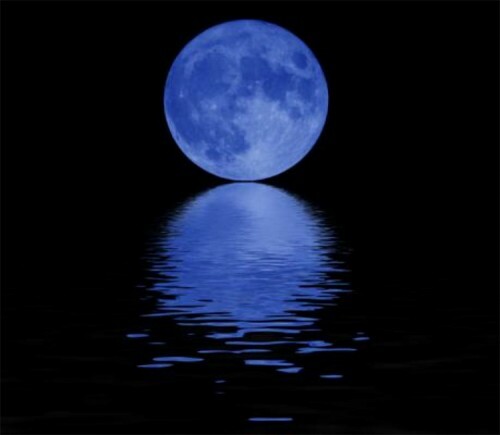 As we set off for the other side of the Peninsula that day, someone said, “Did you know that today is the Blue Moon?” I didn’t, but given the timing of many of the other SOS events, it was no real surprise! I was also reminded that in a couple of days time, the second half of the rare planetary Star of David Merkaba – called by some The Second Sirian Universal Merkabah – would appear in our skies. I don’t think I could have found a better description of my Sounds of Source experiences to date, which have clearly demonstrated for me that we do indeed dream our world into being! An what better time could there possibly be, to be calling in the Cosmic Source energies for our healing and growth, than at the time of the presence of the ‘Sirian Universal Merkabah’ in our skies! 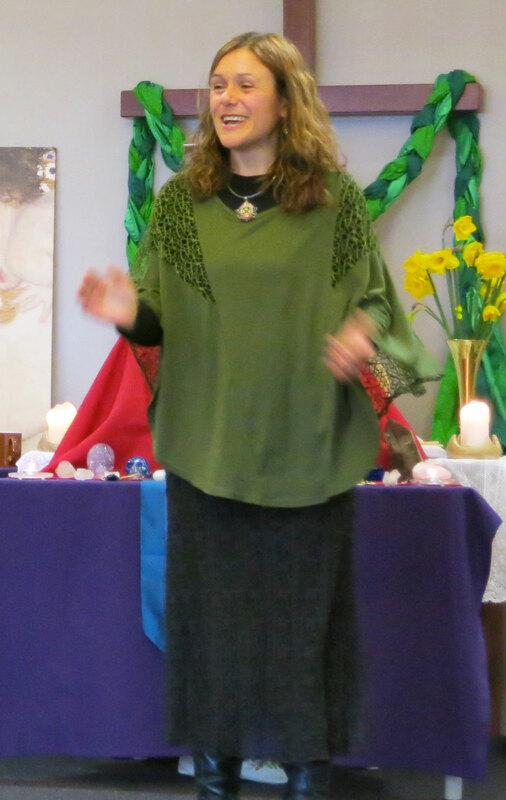 Given the inclement winter weather, we planned to do at least the first part of the Earth Ceremony inside. Weather allowing we would then proceed to down to the ocean. The location and setting for all this special event could not have been more perfect – Michelle Kingston’s Divine Light Healing & Meditation Centre at St. Andrews Ocean Beach, Rye. Michelle is a ‘Divine’ soul herself so her Centre is aptly named. Her magnificent, newly built Temple space, backs onto the section of the Bay where the whales come in twice a year. 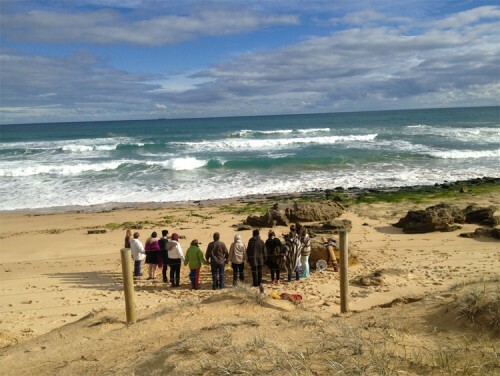 Michelle runs an annual whale day, during which she leads those assembled through the walking tracks around her home, to view the whales and send Love and prayers to them. She told us the whales had just visited the Bay, so their beautiful energy was still present. 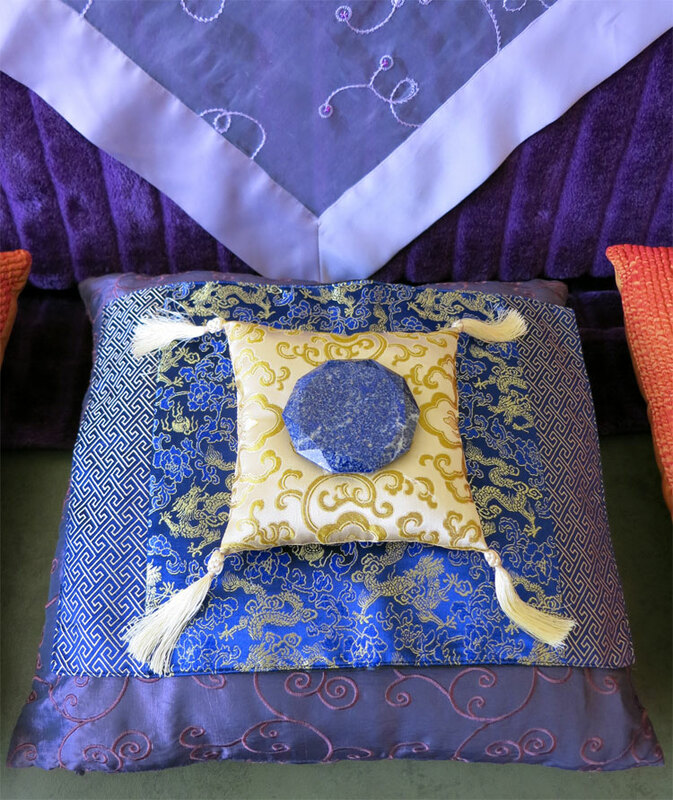 Stepping into Michelle’s Temple space that morning was like being wrapped in a blissful embrace. Everything about the space – the energy, the beautiful artworks, the colours and the warmth, were incredibly nurturing and special. 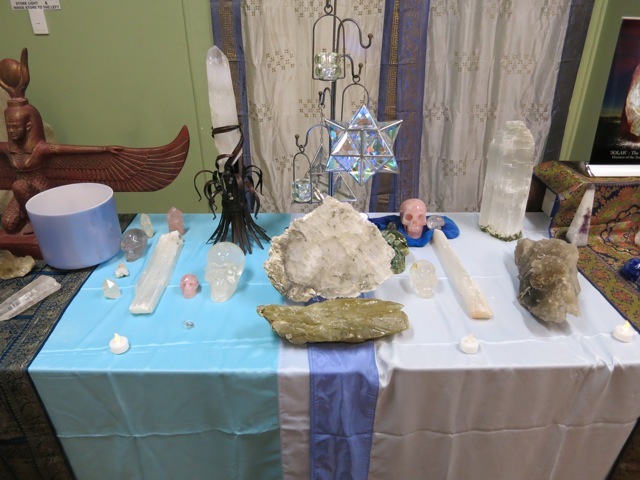 The selected group of participants, which included most of the Melbourne Sounds of Source Hosts, had come laden with their own tools of beauty, adding to the power of the central crystal grid. 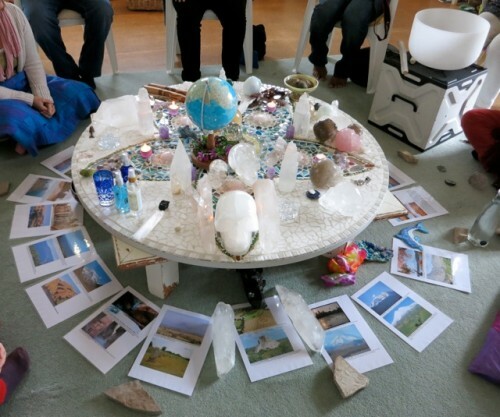 Michelle had also shared with me her story of the Crystalline Pyramid in the Bay…. Bunna opened with a prayer in the language of his people, followed by a deep trance channelling of the Sirian Sounds of Source from myself. 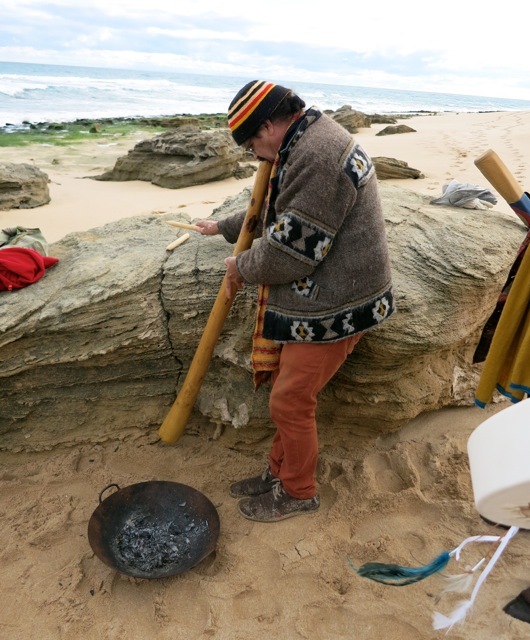 Bunna sang us his whale songs and invited us to join him….we did and it was extraordinary. The gods….or perhaps the whales….were on our side! The gale force winds and rains of the previous several days, had given way during the morning to bright sunshine – perfect conditions for our journey to the shore! 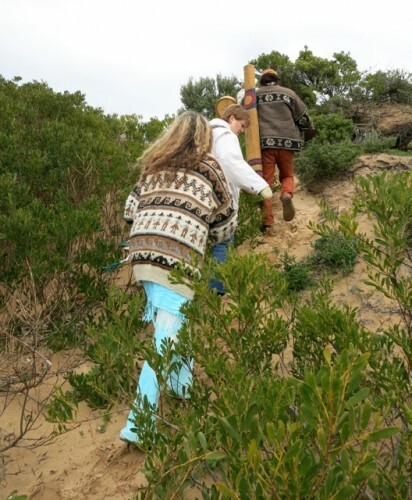 It was a magical trek through the dunes! As soon as my feet hit the walking track, I found myself singing to the ocean and the whales. This continued non-stop, for the duration of the lengthy ceremony. We called to the whales and sent them our Love. This was a blessed time with Soul family, that I think all of us will treasure forever. And so, with this magnificent experience, my Melbourne Sounds of Source Odyssey ended. My heart was full to overflowing, just as it had been upon the completion the South Queensland SOS journey. Once more I felt and overwhelming sense of gratitude for each and every one of the wonderful Melbourne Hosts and their helpers, as well as to all the Sounds of Source attendees, who had responded to the call of their soul to become part of the creation of this powerful new Melbourne Gateway to Source. “Sing out the Song of Love, for all who wish to Hear”. I felt that I had fulfilled that task here in Melbourne. 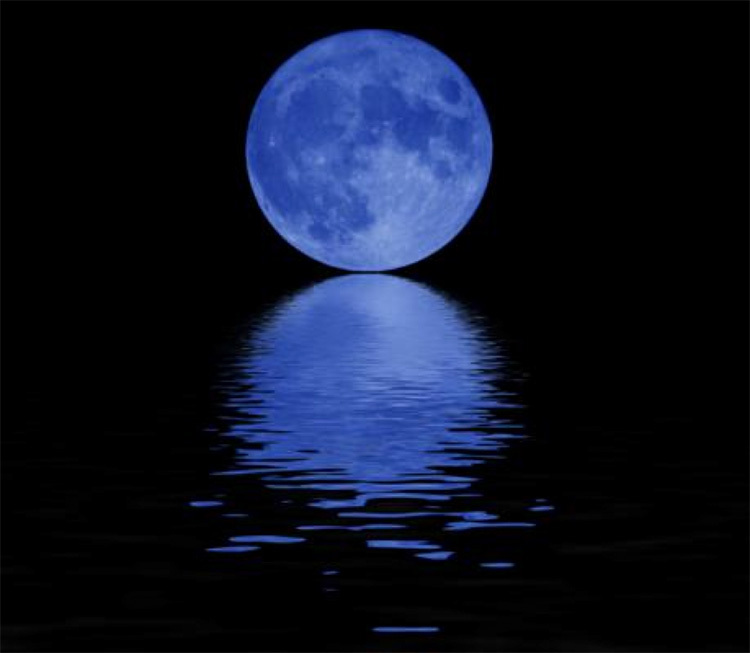 The Song of Love had been sung…the new The Pillar of Light had been anchored. It felt good…and it felt ‘right’. Driving: from Melbourne. Melways 52, C5. Train: Tram stops directly in front. Parking: Some limited parking at the venue. Parking also available directly across the road at the Childcare Centre which is not open on Saturdays, so there should be spaces! Time: 3pm – Registration from 2.15pm. 22 Heversham Drive, Seaford, Melbourne, Victoria 3198. Train: Train to ‘Kananook Station’ on the Frankston Line. At Kananook board a 778 or 779 bus and alight at the bus stop in front of Minuteman Press/Canoe Innovations. Its then just a short two minute walk around the corner which is next door to Australia Post. Parking: The Mystical Dragon has off-street parking for 8 cars and, being a Sunday, there is also plenty of street parking outside the venue. Permission to use the Post Office use car park has also been granted as they are closed! Parking spaces behind the Community Centre.